We offer these three prayers against despondency for those losing loved ones. We all know that death is inevitable for each of us. As we read in scripture “it is appointed unto men once to die” (Heb. 9:27); or as St. Augustine once put it “Death alone is certain” (that and taxes, as the saying goes). Yet, as thinking, feeling human beings, we can’t help feeling sorrow, confusion, and even despair at the death of those we love. True, our Lord said we must carry our own crosses on the road to Eternal Life, and that we should, in fact, must trust in Him to see us through challenging times as discussed here. 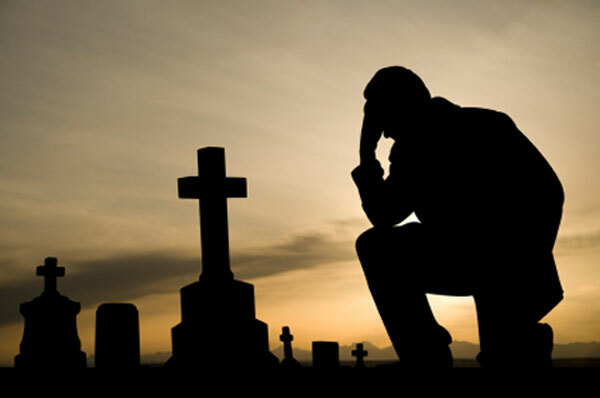 Still, when facing the loss of people we care about, the temptation comes all to easily for us to turn away from God as we contemplate our own emotional, and, in many cases, financial devastation (as when the “breadwinner” of a family passes away). Heavenly Father, please give me the strength I need to show your love and compassion to (Name here) in his/her dying days. Be with me in this fragile, emotional time so that I may feel and share Your peace with him/her. Dear Lord, give me the grace to help make N.’s last hours here on earth with me as peaceful and loving as possible. May Your will be done for both of us. I ask this through Christ, Lord. Amen. This second prayer against despondency is for those who are bereaved. It deals with a more spiritually poisonous temptation, that of turning away from God and blaming Him for all our troubles. Heavenly Father, I come to you in this dark hour feeling broken and trying not to let anger or bitterness against you make my grief even worse that it is now. All I can think of right now is why did you let (Name here) suffer this way? Why must you take him/her away from me now? Satan would like nothing better than for me to turn against you now, as if he, the prince of darkness could shine any light on this tragic situation. Help me to see that this will only make things worse! Help me instead to offer up my grief to you at my loss, sharing as You did in the loss of your Son, knowing you can always bring good out of a bad situation. Help me to remember that you have something much better in mind for my loved one, indeed for all of us, in Heaven. Help me to offer up my pain to you instead of turning away from you, for the forgiveness of sins and sinners, much as our Lord did at Calvary. I ask this through Christ our Lord. Amen. This last one is taken from an old prayer book and reminds us of the importance of carrying on with our good intentions in trying to do God’s will, so that we may be better prepared to face our Lord at our own passing. The reference to the Bridegroom below calls to mind the parable of the ten virgins in Matthew’s Gospel (Mt 25:1-13). You may recall that five who were caught without enough oil in their lamps wound up shut out of the wedding party when the bridegroom appeared after a delay, just as we could be shut out of Heaven! Grant, O Lord, that while we lament the departure of Thy servant, we may remember that we are most certainly to follow him. Give us grace to prepare for that last hour by a good life, that we may not be surprised by a sudden and unprovided death, but be ever watching when Thou shalt call, so that with the Bridegroom, we may enter into eternal glory: Through Jesus Christ our Lord. Amen. The main point from these three prayers against despondency is to keep focused on doing God’s will in the face of tragedy just as He did at Calvary, and living wisely. And, by all means, keep praying for yourself and your loved ones who have passed away, that you may have a glorious reunion with them in Heaven when your Earthly Pilgrimage ends!